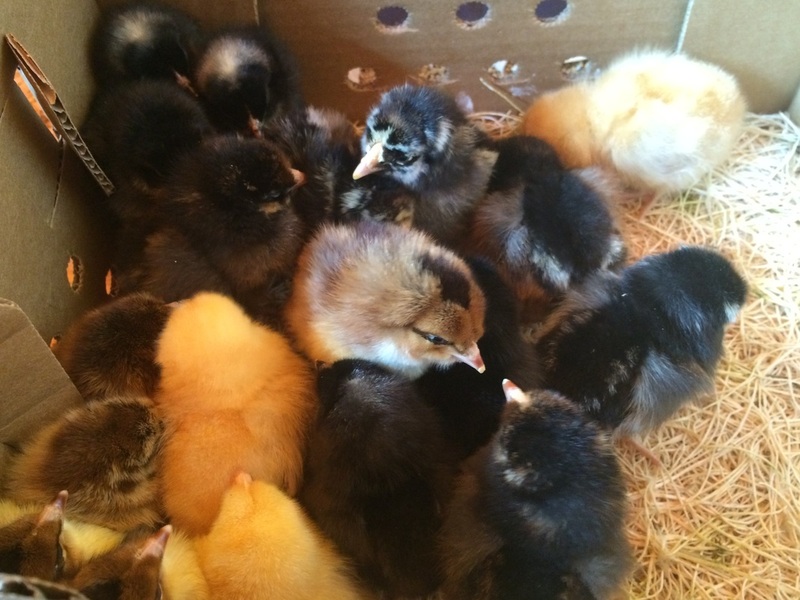 The idea was beginning to grow on me, except…I knew nothing about owning chickens. Buck had chickens when he was a kid, but that was a while ago (well, maybe a long time ago). So through the long, cold, snowy evenings I researched chickens. My cousin has chickens, so I got information from her. She recommended Cold Hardy Breeds for our weather. Ok…that was a start; I didn’t even know there was such a thing. More research, more reading, more note taking. One thing my cousin did say was how much she absolutely loved having her chickens. I am not a “feathers” kind of person. All our pets have always had fur, with the exception of the guppies when I was a kid – which was a short-lived venture - and a parakeet named “Pal”. I was very young then and for some reason, no matter how strong my connection was with furred animals, I didn’t seem to have the same with feathered ones. So the concept of absolutely loving chickens was not one I could comprehend. I spent a couple of months learning about chickens: what they required for housing, feed, bedding, space, safety. I knew I wanted to raise them on a natural diet: no antibiotics, no hormones. So I researched feed ingredients and suppliers. 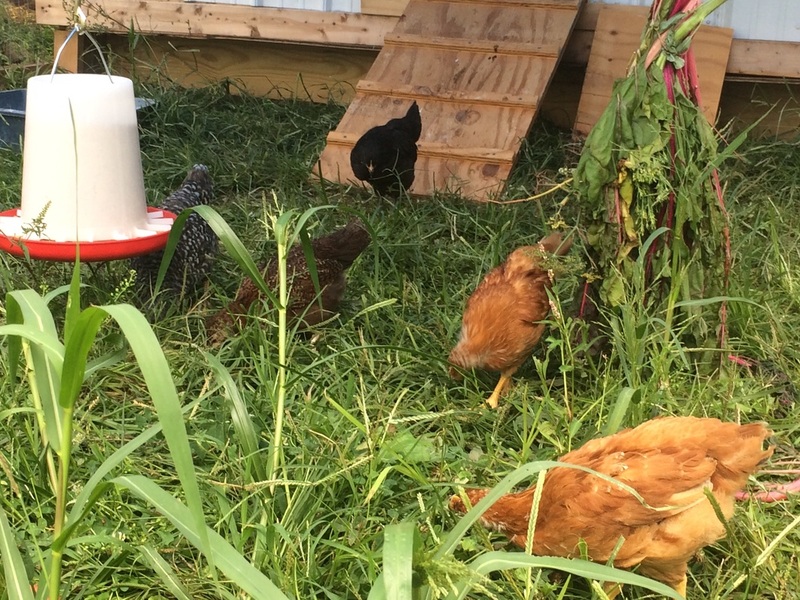 I learned that chickens have delicate respiratory systems and could not tolerate a lot of dust, so the sawdust I used for our horse stalls would not work for bedding our coop. I read about recommended square footage per bird so they were content. Crowded, bored birds would tend to peck at each other and cause problems. Our winters are long, so indoor accommodations needed to be considered very carefully. Buck worked out logistics of electricity and access to water, so we decided where best to put our coop and enclosed run. Once we figured out what they required to be healthy and well cared for, the next step was to figure out which ones we wanted to get and where to get them from. We knew we only wanted layer hens. We didn’t want roosters, as we had no intention of breeding the hens. Adding a rooster to the mix meant we would have to candle our eggs to make sure they weren’t fertilized - an added step we didn’t want to deal with. Buck’s requirements were that they lay extra-large eggs and that they lay them proficiently. Armed with that knowledge and the fact I needed cold-hardy birds, I started my search for layer chicks. I found my way to My Pet Chicken (www.mypetchicken.com )which was perfect for what I was searching. I was drawn to the “pretty” birds: birds of color and pattern. I narrowed it down to seven different breeds. Per the shipper, I had to order in quantities of three. I asked Buck, “Which ones should I narrow it down to?” and he replied, “Get three of all seven varieties. They probably won’t all live.” So I placed my order and had to wait until July when they would finally arrive. After I’d ordered my little chicks, Buck informed me that we should get some Guinea Hens to protect them. The research began again, as I had no idea what Guinea Hens were. I found I could get them locally, but had to order a minimum of six. Now that I had a quantity of birds we could start planning our chicken coop and protected chicken run for the birds. While waiting for the birds to arrive, I read…. a LOT! What they could eat, what they couldn’t eat. What they need for feed, for grit, for nutrition. What herbs are good for their health and which flowers benefit them. I think I planted more herbs and flowers for my pending chicks last summer than I did for myself and Buck. I read about how to care for them, what ailments they could get, and how to recognize and cure those ailments. I read about coop planning, ventilation, drafts, roosts, nesting boxes, bedding and cleaning methods. I read about heat lamps, dust baths, and coop doors. I learned about predators, and how to keep them at bay. We prepared like parents expecting a child. In July they finally arrived! I tended to them dutifully to make sure they were healthy, strong, and getting along with each other. They grew so quickly, it was hard to keep up with them! I found myself spending more time in the coop. I would bring a chair inside and sit and watch them pecking around and chirping. There is something relaxing (for me, anyway) about listening to the chirping and clucking of busy hens. It's my respite in the morning before my busy day begins, and then again at night to unwind from the hectic pace of the day. They started to notice me and I began to notice their different “personalities”. I enjoyed the interaction with them and looked forward to bringing them special treats from the garden every day for them to feast on. I kept track of what they liked best and what they didn’t particularly care for. 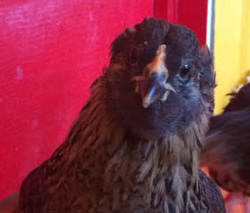 On days I when I cleaned the coop, I began sitting with my back against the wall and waiting for them to investigate me as I gently rubbed my hand across their backs, to get them used to being touched. A few unique ones took a liking to sitting on my feet or jumping up on my legs when I spent time with them. I became fonder of them by the day and began realizing that I, too, absolutely love my chickens! I'm proud to report that all of those chickens are still with us. Happy, healthy and now laying delicious eggs! The guinea hens are noisy and comical. They’re quite individual, with unique personalities. Even the Scottish Highland cattle in the neighboring pasture hang out watching them sometimes, as if for entertainment. I cannot stress enough the importance of doing due diligence before acquiring ANY animal that will require your care and responsibility, be it cat, dog, bird, horse, chickens or whatever! Research that animal. Know beforehand what it will require for time, housing, feed, attention, and in some cases manure management. Know YOURSELF and be honest! Will this animal and its needs fit your lifestyle, environment and climate? Can you rightfully give this animal what it will need to not only just sustain life, but have a good life? Every person in the care of a living thing, no matter what it is, should take these questions seriously and give them thought. If you have done your homework and your soul searching and adding this new addition to your life is the right thing…you will gain gratification in ways you would not expect from being its caretaker. Planning goes a long way. You owe it to not only to yourself, but to the little lives that depend on you. In the upcoming months, Buck and I will engage in a search like this again. This year we are contemplating getting a Heritage Pig or two. Join us in the upcoming issues in our exploration on keeping pigs on the farm. What's on the plate for March, so to speak? Salad for the chickens (as opposed to chicken for the salad) includes whatever's growing in the garden at the time. It can include violas, pansies , marigold petals, sage, calendula, lavender, oregano, mint, thyme, fennel fronds, parsley, and nasturtium, to name a few. 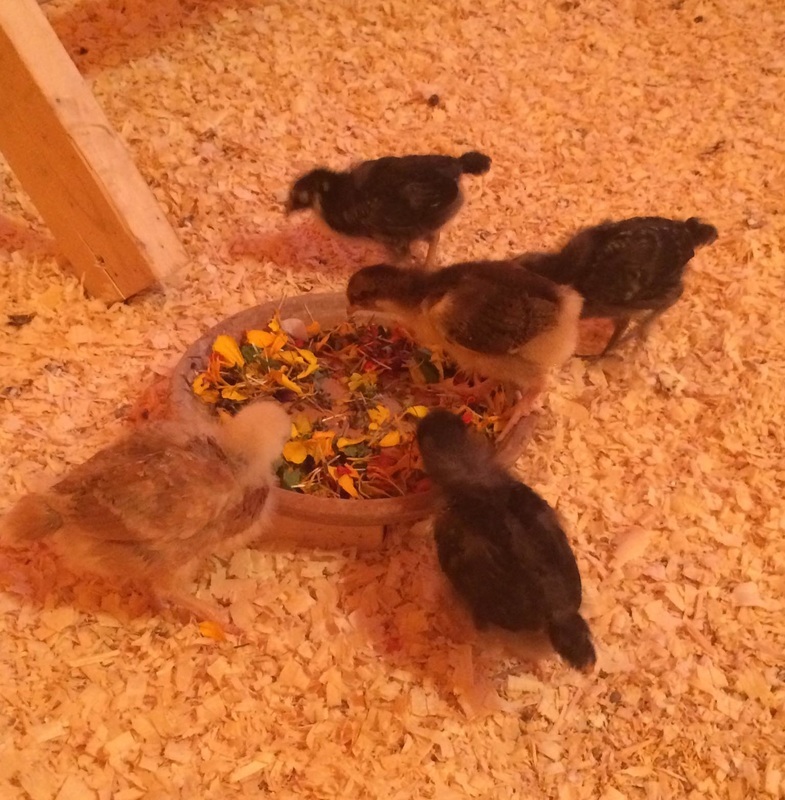 When the chicks were small, we snipped the salad ingredients into small pieces to make them easier to eat. Hanging out with the girls. 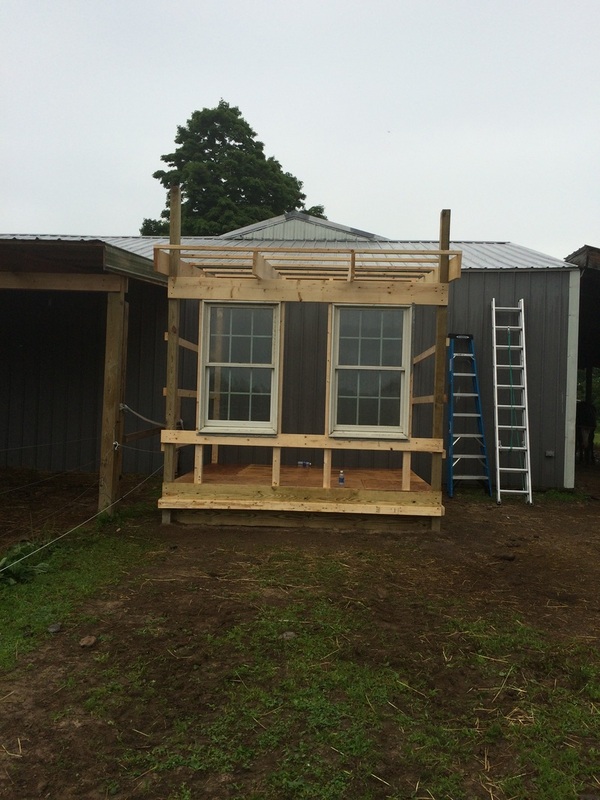 Does your barn stink to high heaven? We've figured out how to reduce that and make spending time with your animals more pleasant for all concerned. I’m a firm believer that barns should not be noxious smelling. I wouldn’t want to live in that type of environment and I don’t believe my animals should either. I have people come to my barn and say, “Your barn doesn’t smell like a barn.” When asked what they mean, specifically, most barns they’ve been to have had the smells of ammonia and manure hit them in the face when they walked in. It’s a fact that if you have animals, no matter what kind they are, they're going to produce waste, but with proper cleaning waste odors should be minimal. I enjoy spending time in my barn and being with my animals. I enjoy having their environment smelling not only clean, but fresh and aromatic. I like to do a little “extra” and not only have things clean, but also smelling fresh, and provide a bit of aromatherapy for their living spaces. As I mentioned in the Wild Heart Mustangs™ January 2016 issue, I like to use a stall freshener for the horses’ and mules’ stalls. I’ve found that our little heifer, Holy Cow, who we’ve got stalled now while we are trying to gentle her, especially likes the stall freshener as she tries to catch it in her mouth when I’m spraying her stall. Duck: it's not just for dinner any more! Buck, nephew Bobby and great-nephew Little Bobby were up way before sunrise to go duck hunting the day we had this wonderful breakfast. They set their rig out and waited for shooting time. Little Bobby is learning the ropes by watching his dad and Buck. It’s wonderful family time, teaching generations of knowledge to a new generation. When they got home around 8:00 a.m., it was definitely time for breakfast, with hearty appetites that needed to be satisfied. This is a great recipe to fill the hungry hunter’s belly. Breast out the ducks (See How to Breast Fowl, at the right →) and wash the breasts thoroughly before proceeding. Remove silver skin from breasts. Slice breasts thinly against grain. Make sure to feel for BB’s from shotgun shell and remove any found. Once breasts are sliced, place in a bowl and add the first five ingredients. Mix well and set aside to marinate. Thinly slice onions. In a large pan, sauté onions in olive oil until tender. Remove onions from the pan and set aside. Heat the remaining oil until very hot, but do not boil. Remove duck breasts from the marinade. Discard marinade. Add duck breasts to the pan and stir constantly for about 2 minutes. Do NOT overcook! When meat starts to feel “rubbery”, remove duck breasts from the pan and combine in a bowl with the reserved sautéed onions. Discard the olive oil in the pan you cooked the duck in. Add the bacon to it and cook to your preferred degree of crispiness. Remove to drain on a paper towel. Beat the eggs and half and half in a bowl. Melt the butter in the cooking pan. Add the egg mixture and cook, stirring occasionally. When the eggs start losing their shininess, add the cheese to scrambled eggs and stir until the eggs are set and the cheese is melted. 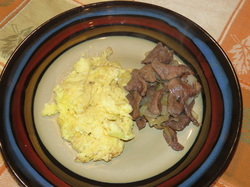 Serve the duck breast with the onions, scrambled eggs and bacon. A carrier oil is a vegetable oil such as coconut oil or grapeseed oil that can be used to dilute essential oils (EO). Young Living V-6 Vegetable Oil Complex is an excellent carrier oil for all applications. Young Living V-6 is super light so it doesn't leave a heavy oil residue. Carrier oils ensure that EOs applied topically are comfortable. Using a carrier oil also helps slow down the absorption rate of the EO, as well as extending the oil to get a broader coverage area. Water speeds up the absorption rate of the EO and drives the EO deeper into the tissues - which is why you use a carrier oil rather than water when having a skin sensitivity to a particular essential oil. Dilution with a carrier oil does not dilute the effect of the EO, and prevents waste due to excessive application. Vegetable shortening, butter, margarine or petroleum derivatives (petrolatum jelly) should never be used as carrier oils. Some consumers choose to avoid olive oil as a carrier oil because of its strong aroma and thick viscosity. “Hot oils” are oils that, when applied to the skin, can cause a hot or burning sensation. Young Living recommends using a patch test procedure prior to first use. To perform a patch test, apply 1-2 drops of EO to a patch of skin such as the forearm. Observe that area of skin over the course of 1-2 hours for any noticeable reaction; usually reactions occur within 5-10 minutes. If you experience a hot or burning sensation or if you develop a rash, add V-6 carrier oil to the affected area as often as needed. Examples of “hot” oils include cinnamon, clove, lemongrass, peppermint, oregano, thyme, basil, cypress, Exodus II, and Thieves. "Hot oils", or blends that contain them, may need extra dilution with a carrier oil. Essential Oil Use for YOU! Fresh, nostalgic, and instantly recognizable, Peppermint essential oil’s scent invigorates the mind and senses, while inspiring a sense of peace. 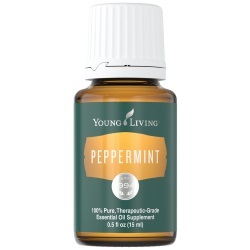 Used topically, Peppermint oil creates a cool, tingling sensation on the skin, making it a favorite for sports massage and an important part of Young Living’s Raindrop Technique®. Great for flavoring food and drinks. Add 1 drop of Peppermint essential oil to a glass of water for a refreshing drink. Create your own home spa! Add Peppermint and Eucalyptus to hot bath water and enjoy the relaxing, invigorating scent and aromatic steam. ​A Wild Heart Mustangs SPECIAL - this collection is available to our readers at 10% off the retail price. Special price for this collection $153.65. This recipe, courtesy of Jill Winger's Natural Homestead (the PrairieHomestead.com), has been tested and approved by the Lainhart chickens. 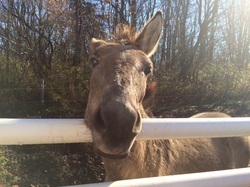 Jill is a full-time homesteader in Wyoming. She lives close to the land and tries to provide for her family solely from what she grows and harvests on her farm. She emphasizes that coop spray is not intended to replace regular cleaning. It's pleasant used in conjunction with your coop management and for in-between-cleaning freshening. Here's the recipe for the Hen-Approved Coop Spritzer Spray that keeps the girls in our hen house happy. I'm not a particular fan of the waft of vinegar outside of cooking, so I opt to leave it out. The essential oils in this recipe are helpful in creating a calming atmosphere as well as repelling insects. Combine all ingredients in a 1 quart spray bottle and shake well before each use. This is safe to use as often as you like. Note: if you don’t have the essential oils listed above, you can also try roman chamomile, lemon, peppermint, citronella, orange, thyme, bergamot and rosemary. The Lainhart Director of Quality Control keeps a vigilant eye on every step of Coop Spray production. We aim to please her, because she'd have no mercy on us otherwise. Face the bird on a solid surface on its back with the head towards you. Using both hands, peel the skin back away from breast meat down to sides of bird near wing joint. With breast meat exposed, cut along the side of the breast bone and filet meat off the carcass. Click the picture below for a printer-friendly recipe for our Duck Breast Breakfast ​& How to Breast ​Fowl instructions, with lots of photos to tempt you to try this at home at the earliest opportunity when ducks are in season. Let's start by understanding our animals. Animals have a MUCH more sensitive sense of smell than humans. Oils should be introduced to an animal with this in mind. I like to put a drop or two in the palm of my hand, rub my hands together, and slowly bring it near them. Many times they will draw themselves closer to investigate the scent. Secondly, studies have suggested that hair follicles enhance transdermal absorption of essential oils. The denser an animal's hair, the more sensitive they may be. This also means that essential oils do not need to be applied directly to the skin to be effective. Simply stroking them on your equine, as if petting them, is more effective. Thirdly, know your oils! Some oils are "hot oils" and cannot be put on directly or they will "burn" the skin. These oils should be mixed with a carrier oil. Some oils can cause photosensitivity. Essential oils can be administered safely to your animals in a variety of ways. We will spotlight a different oil every month, methods of application, and uses. If you are looking for a natural solution for your animal, please feel free to CONTACT us and ask. Equine: Peppermint has been show to aid digestion in animals, as well as humans. Peppermint can be used to help cool overheated horses and also reduce fever when diluted and sprayed on the shoulders and front legs. It can be used in water buckets on hot days and when traveling, and it seems to encourage hydration. Peppermint soothes asthma and bronchitis. It is often the last oil to be administered with a series of oils because it drives the other oils in. Whatever brand of essential oil you choose to use, make sure it is a Therapeutic Grade Essential Oil. Using a lesser quality oil can not only be ineffective, it can be harmful. • Grade A essential oils are pure therapeutic quality and are usually made from organically grown plants distilled at lower pressures and temperatures using steam distillation. • Grade B essential oils are food grade; they may contain synthetics, pesticides, fertilizers, chemical/synthetic extenders, or carrier oils. • Grade C oils are perfume grade and may contain the same type of adulterating chemicals as food grade oils. They also usually contain organic solvents which are used to gain a higher yield of oil per harvest. This is what’s in the store-bought perfumes and other scented products. • Floral Water is a byproduct of the distillation process. It can be a valuable product if it comes from a Grade A distillation process. Accordingly, it is of very low quality if it comes from poor quality raw materials and/or poor distillation processes. It is usually found in skin and hair products.